These images will be good to follow when developing my styling techniques that i actually need to start playing around with and pulling together. 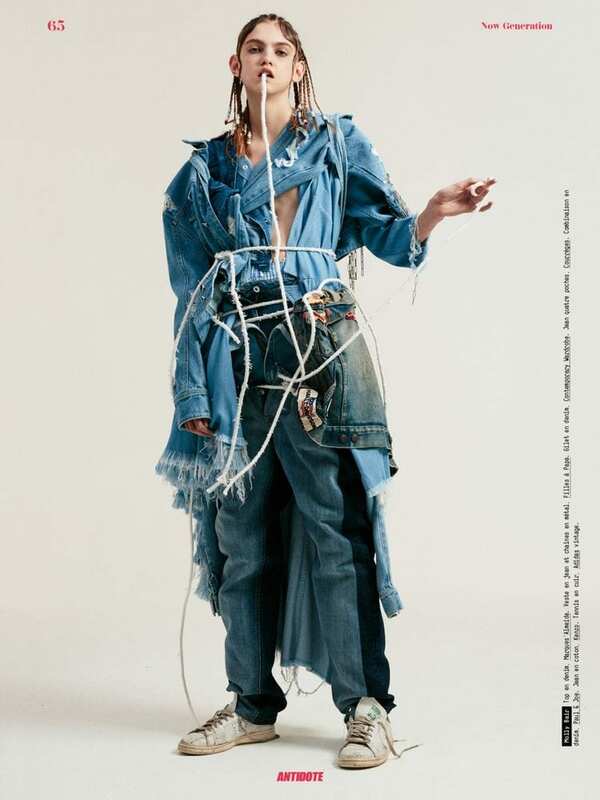 How the stylist has layered different tones of denim and various denim pieces on top of one another or in unconventional positions allows each area of the body to become really apparent. The tones contrast one another to help create this segmented figure and the use of carefully positioned rope helps too. I could look into how rope and frayed pieces of material could help to build up layer amongst the clothing and i feel it would be a really effective technique in helping me to segment the body and emphasizing the deconstruction of the clothing. Alongside this, the backdrop in the second figure perfectly executes a subtle take on a deconstructive theme. Again, the crumpled fabric identifies as being quite segmented and splits off area from area. Executing the perfect backdrop will be very important for this shoot as it needs to compliment the clothing and theme but not take too much away from the concept.